Replace the spindle nut and retaining washer on your EZ-Lube axle with 1" spindle with 14 threads per inch pitch. Includes 2 spindle nuts and retaining washers. Call 800-298-8924 to order Redline accessories and parts part number RG05-100 or order online at etrailer.com. Free expert support on all Redline products. Guaranteed Lowest Price and Fastest Shipping for Spindle Nut Kit for EZ Lube Axles. Accessories and Parts reviews from real customers. Replace the spindle nut and retaining washer on your EZ-Lube axle with 1" spindle with 14 threads per inch pitch. Includes 2 spindle nuts and retaining washers. Speaker 1: Today we're gonna take a look at the spindle nut kit for E-Z Lube Axles. 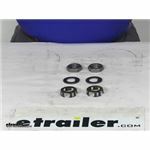 Now, this part will replace the spindle nut, the D washer, and the nut retainer on your E-Z Lube Axles with this complete kit. This is designed for one inch spindles that have 14 threads per inch thread pitch. This kit is designed for E-Z Lube Axles, because an E-Z Lube Axle does not allow the use of a Cotter pin to retain the nut on the spindle. It has to use the nut retainer to work on an E-Z Lube Axle. This part will include everything shown here, the two spindle nuts, the two D washers, and the two nut retainers. So, when you go to install these on the spindle you'll first put your D washer on, then you'll screw your nut on, and then clamp on your nut retainer to hold it into place. That should do it for the review on the spindle nut kit for the E-Z Lube Axles. Order: RelevanceNewestRating - High to LowRating - Low to High Replace the spindle nut and retaining washer on your EZ-Lube axle with 1" spindle with 14 threads per inch pitch. Includes 2 spindle nuts and retaining washers. They are so much better than the originals. Thanks for a great product! The most cost effective way to get the nut retainers is to get the part # BK2-100 and then instead of using the cotter pins use the part # RG05-100 instead. The kit for your hub isn't available and by the time you piece all of the components together it's more cost effective to just get the kit. The Replacement Nut Retainer Jam Nut, # 6-190, is designed to fit the 1 inch Trailer spindle nut that fits the 2,000 lbs to 8,000 lbs axles with E-Z Lube spindles. The kit you referenced, # RG05-100, will include the same # 6-190 jam nut retainer and # 6-191 jam nut. The actual thread size on the spindle is 1 inch. The jam nut and the retainer measure 1 inch to fit the 1 inch threads on the spindle. The Trailer Idler Hub Assembly for 3,500-lb E-Z Lube Axles - 5 on 4-1/2 - Galvanized # AKIHUB-545-35-G-EZ-K does not come with the spindle nut. That would come with your axle. For a 3,500 lb axle you would want the Spindle Nut Kit for EZ Lube Axles # RG05-100. The Nut is a 1 inch nut with 14 threads. The socket or wrench needed for this is 1-1/4 inch. If you just want the nut # 6-191. For the retainer # 6-190. The part # RG05-100 is a retainer nut and washer designed to work with the standard size spindle the hub # RG05-100 is designed as a fit for. The Spindle Nut in the Redline # RG05-100 has a 1 inch inside diameter and a 14 thread per inch thread pitch. I am in the process of having this information added to the product description. After you have your hub and bearings on your spindle you will then put on the washer, then the nut, and then the nut retainer (yellow piece) from the Nut Kit # RG05-100. The nut retainer helps to keep the nut from backing off and, ultimately, your hub. You can see this process being performed at the 4:25 mark in the attached installation video. I spoke with my contact at Redneck and he informed me that yes, the Spindle Nut Kit # RG05-100 should work well on your trailer that the Tang Washer part # 5-101 is recommended for. Since you have a 3,500 lb axle most likely the diameter of the threaded portion of the spindle is 1 inch. You will need to verify that. And since the spindle has a hole in it for a cotter pin you would need a castle nut. For that I would recommend the Trailer Spindle Nut # 165686. For a compatible cotter pin I would recommend the Cotter Pin part # 165649. The Spindle Nut Kit # RG05-100 that you referenced is for a different style spindle so I would not recommend it for you. Since the D60 Dexter Axle uses a cotter pin and castle nut the # RG05-100 would not be the correct kit for you. For that I would recommend the Trailer Spindle Nut # 165686. For a compatible cotter pin I would recommend the Cotter Pin part # 165649. People use channel locks typically for installation and removal of these castle nuts since they don't really get torqued down and the length of the spindle prevents most standard sockets from being easily used. The hub part number # 8-258-5UC1-EZ that you referenced would be the correct hub for you as it would be an exact replacement to what you currently have. It comes with a set of matching bearings to fit your spindle. 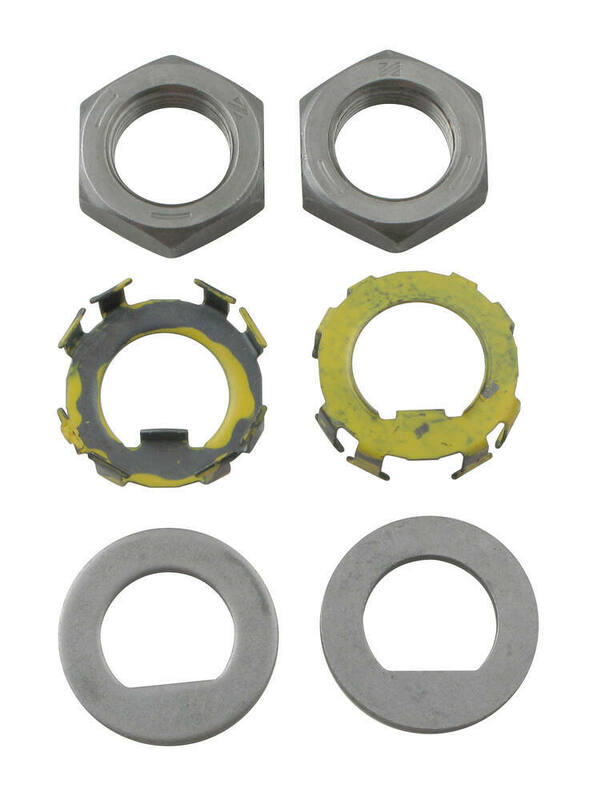 The spindle nut/washer kit you would need would be the part # RG05-100. 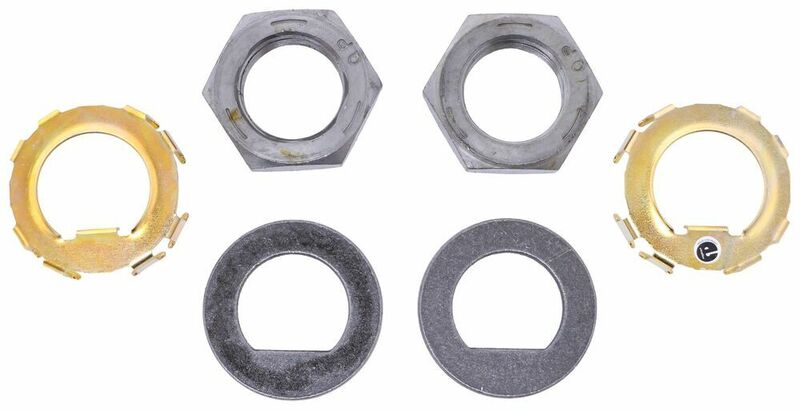 Sounds like you are looking for the # RG05-100 which is a D-washer, spindle nut, and retaining washer kit for EZ lube spindles like what you have. The three parts you mentioned are compatible with each other. The spare tire carrier part # 413200 can have 5 lug wheels attached to it like the Dexstar Steel Mini Mod Trailer Wheel # AM20537 which will fit the trailer hub part # 84545UC1-EZ. The hub does come with a double lip seal but it does not come with a cotter pin or spindle nut. Since it sounds like you have an EZ lube spindle you would want the part # RG05-100 for a spindle nut kit that includes a tang washer. I believe I found the video you are referring to and have attached it below. You will want to fast forward to the 4:45 mark to see the spindle castle nut procedure. As you mentioned you will basically just want to tighten the nut until it stops by itself. You don't want to actually torque it down to any specific spec. I have attached a link that will also take you to our available selection of spindle castle nuts that you can look through if needed. I was unable to find any specific information about your trailer to know anything about the axles that came on the trailer. It is likely that the Spindle Nut Kit for Dexter Standard and EZ Lube Axles # RG05-100 will fit your axle, but you will want to make sure that the threaded part of the existing spindle has a diameter of 1 inch. It sounds like the washer you are looking for is like part # 5-23 which I have added a photo with specs for you to reference. This type of washer is held in place with a spindle washer like part # 5-101. Are you looking for a replacement bearing as well? If you could let me know what the bearing number is, like the the popular # L44649, then I can help you out with getting a replacement.